Hari Merdeka, Malaysia's Independence Day, is celebrated every year on August 31. It's definitely a festive time to be in Kuala Lumpur, or traveling anywhere in Malaysia! Malaysia gained independence from Britain in 1957; Malaysians celebrate the historic event as a national holiday with fireworks, excitement, and flag-waving cheer. Although Kuala Lumpur is the holiday's epicenter, expect smaller Hari Merdeka celebrations all over the country to include parades, fireworks, sporting events, and store sales. Note: Independence Day in Indonesia is also known locally as "Hari Merdeka" in Bahasa Indonesia, but they're two different events on two different dates! The Federation of Malaya gained independence from British rule on August 31, 1957. The official declaration was read at the Stadium Merdeka in Kuala Lumpur before dignitaries that included the King and Queen of Thailand. More than 20,000 people gathered to celebrate the sovereignty of their new country. On August 30, 1957, the night before the declaration, a crowd gathered at Merdeka Square — a large field in Kuala Lumpur — to witness the birth of an independent nation. The lights were turned off for two minutes of darkness, then at midnight, the British Union Jack was lowered and Malaysia's new flag was raised in its place. Major cities throughout Malaysia have their own local celebrations for Hari Merdeka, however, Kuala Lumpur is undoubtedly the place to be! Each Independence Day in Malaysia is given a logo and theme, usually a slogan that promotes ethnic unity. Malaysia has an eclectic mix of Malay, Indian, and Chinese citizens with different cultures, ideologies, and religions. A sense of national unity is more important than ever. 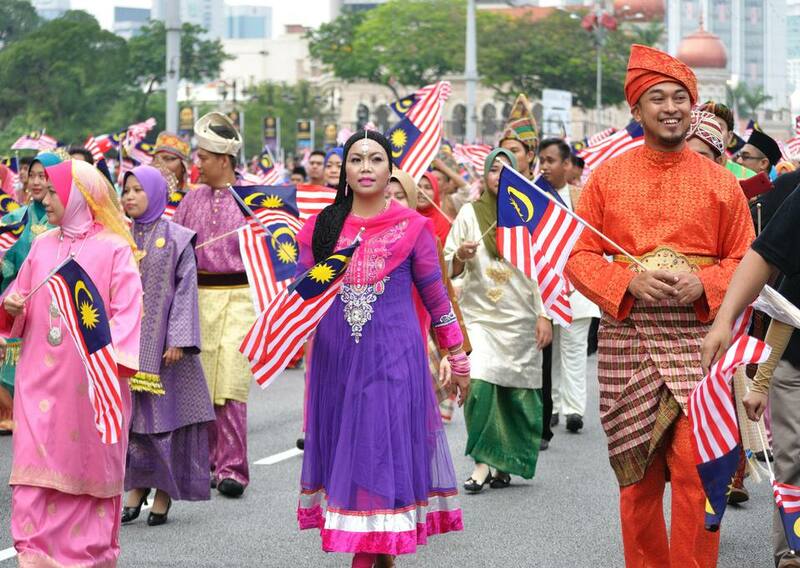 Hari Merdeka ends enthusiastically every August 31 with a massive celebration and parade known as the Merdeka Parade. Lots of politicians and VIPs take their turns at the microphone on stage, then the fun begins. A royal procession, cultural performances, military demonstration, intricate floats, sporting events, and other interesting diversions fill the day. Grab a flag and start waving it! The Merdeka Parade went on tour to different parts of Malaysia but regularly returns to Merdeka Square, where it all began. From 2011 to 2016, the celebration was held at Merdeka Square (Dataran Merdeka) — not far from the Perdana Lake Gardens and Chinatown in Kuala Lumpur. Ask any local where to find the parade. Get there in the morning or you may not find room to stand! The two often get confused by non-Malaysians. Both holidays are patriotic national holidays, but there's a big difference. Adding to the confusion, sometimes Hari Merdeka is called "National Day" (Hari Kebangsaan) instead of Independence Day. Then in 2011, the Merdeka Parade, usually on Hari Merdeka, was celebrated for the first time ever on Malaysia Day instead. Confused yet? Although Malaysia gained independence in 1957, the Malaysian Federation was not formed until 1963. The day became known as Malaysia Day, and since 2010, is celebrated as a national holiday on September 16. The federation was comprised of North Borneo (Sabah) and Sarawak in Borneo, along with Singapore. Singapore was later expelled from the federation on August 9, 1965, and became an independent nation. As you can imagine, parades and fireworks are fun, but they cause congestion. Lots of Malaysians will be enjoying a day away from work; many will be shopping or adding to the often-bustling atmosphere in places such as Bukit Bintang in Kuala Lumpur. Try to arrive in Kuala Lumpur a few days early; Hari Merdeka affects flight prices, accommodation, and bus transportation. Banks, public services, and government offices will close in observance of Malaysia's Independence Day. With fewer drivers available, long-haul buses to other parts of the country (and the buses from Singapore to Kuala Lumpur) may be sold out. Rather than trying to travel around during Hari Merdeka, plan to stay in one place and enjoy the festivities! Although a majority of local residents speak English, knowing how to say hello in Malay will help you meet new friends during the holiday. The easiest way to say "happy Independence Day" to locals is with: Selamat Hari Merdeka (sounds like: seh-lah-mat har-ee mer-day-kah).